Challenge Cup Global Finals Are Back! Challenge Cup Global Finals is the culmination of this year's 75-city Challenge Cup pitch competition! 20 startup winners will advance from semi-finals to compete on stage at Washington, D.C.'s newest venue, The Anthem, for a chance to win the grand prize! You won't want to miss this chance to experience new technologies and a global, diverse set of ideas in one exciting evening! The prize? The winner will receive a $100,000 investment from Revolution, the DC-based investment firm. Join 1776 and Revolution to celebrate our Top 20 finalists and choose the Challenge Cup 2018 Winner! Get your ticket today and check back as we announce the finalists, judging lineup and reveal more surprises in the coming months! Enjoy food and drinks on us! Welcome to Challenge Cup Global Finals! Vote for your favorite with the 3Pillar App! Celebrate the finalists and enjoy free food and drinks on us! Evan Burfield is the cofounder and CEO of 1776, where he works with startups around the world tackling important challenges in areas like education, health, energy, transportation, and cities. Ted Leonsis is a Founder and Partner of Revolution Growth as well as a nationally renowned entrepreneur, investor, and sports team owner. Ted is the Founder, Chairman, majority owner and CEO of Monumental Sports & Entertainment. The 2017 Challenge Festival Global Finals and Closing Party will take place at The Anthem in the new District Wharf. Parking is available via garage. 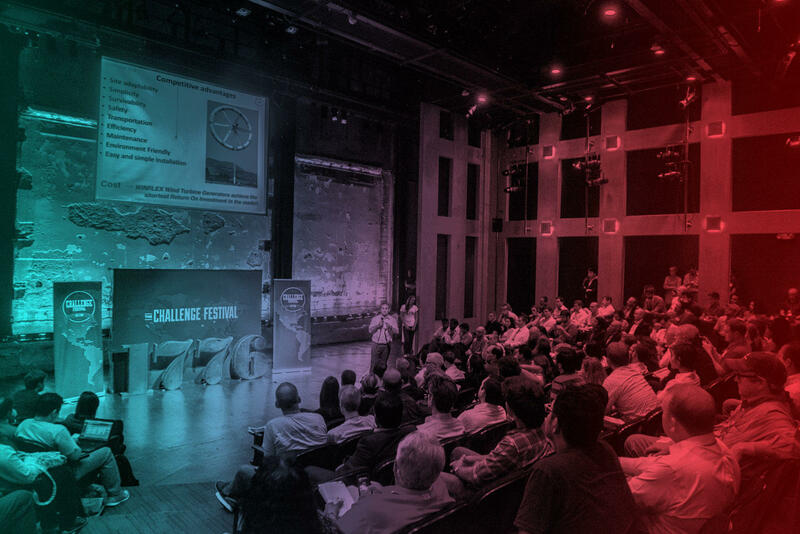 1776 Challenge Cup in partnership with Revolution and powered by UNION is much more than a competition — it’s a movement of startups bringing world-changing ideas to life and solving meaningful problems on a global stage. Challenge Cup Global Finals convenes investors, policymakers, and innovators from across the globe to examine and discuss pressing global challenges. 1776 started Challenge Cup four years ago to discover the most promising, highly scalable startups poised to solve complex challenges across borders, regulated industries and emerging technologies. This year, Challenge Cup is presented in partnership with investment firm Revolution, an active champion for the emergence of entrepreneurial communities and startups outside of Silicon Valley. This partnership reinforces 1776’s and Revolution’s core belief around startups and innovation: great companies can start and scale anywhere. Challenge Cup takes place in 75 cities. In each of these cities, 1776 partners with a leading local startup program to host a Challenge Cup experience on 1776’s UNION Network, a digital platform that connects startup ecosystems around the world. These qualifying competitions identify one winning startup from each city to advance to Virtual Semifinals via UNION. From there, the top 20 startups are chosen as the Challenge Cup Global Finalists. At Global Finals, one lucky winner will receive a $100,000 investment from Revolution, the DC-based investment firm! Meet the Top 20 Finalists! Want to learn more about our Top 20 Global Finalists? You can learn more about each of our finalists below. You can also visit ChallengeCupVote.com to watch our 75 Semifinalists' 2-minute pitch videos! The winner of the Fan Favorite vote, who automatically won a spot in the Top 20 is ProvenMed Technologies! Adrich collects and transmits product usage data autonomously through connected smart product labels, so consumer brands and retailers can better understand and serve their consumers. Airside's free Mobile Passport app helps travelers breeze through US Customs & passport control. Over 3 million people have used Mobile Passport at 25 leading airports and seaports! Babierge (baby + concierge) is the leading baby gear rental marketplace now in 125 US and Canadian locations. We help families “Pack Light, Travel Far” by delivering and setting-up clean quality baby gear such as cribs, high chairs, toys and car seats, to their hotel, vacation rental, or grandparent's home. 80% of kids with Autism have daily sleep issues and over 50% have severe safety concerns, often due to their sensory processing. Boogaloo Beds are smart beds that allow a person to control their sensory environments to improve their sleep and safety. Caribu is an award-winning live-streaming communications and collaboration platform whose first focus is helping parents, extended family, and mentors read and draw with children when they’re not in the same location. We are "FaceTime meets Kindle", for kids. Cloudrino IO is a distributed computing platform built on blockchain. CommuScore provides an alternative credit scoring solution for individuals and small businesses that are unbanked and financially excluded because they do not have a credit identity. EasyInsurance is Pakistan's first online insurance aggregator aiming to educate the masses regarding insurance, and digitize & simplify the insurance acquisition process. Empath develops Emotion AI Empath, which can identify emotion from the voice in real-time regardless of the language. Bangkok - Globish Academia Co.
Globish is a technology-based english school for equal access to learning. Hargol is the world's first commercial grasshopper farm and distributor. Grasshoppers are Nature's Most Efficient Protein Source! Knack is a platform for college students to book/list 1-on-1 and group tutoring services. Students struggling in their courses can find and meet up with top performing peers, at their same school, who've previously aced those exact courses. Knack is a local marketplace for peer-to-peer college tutoring. Madorra is a women's health company changing the paradigm for treating vaginal dryness. MU Ltd has developed the "MiniMermaid", self-propelled capsule endoscopy using a fin, to examine the total G.I. tract at once. It releases doctors from the “older and limited” diagnosis method and patients from painful and expensive examinations and fear in finding their cancer too late. myHappymind creates an innovative curriculum for parents, schools and nurseries teaching proactive and preventative mental health habits. Delivered via a technology platform and supported by an app, myHappymind's sole purpose is to give today’s children the skills to thrive in tomorrow's world. Novulis is mobilizing access to preventative dental care through on-site mobile and stationary clinics. It's mission is to bridge the gap of access to preventative healthcare services in Latin America to improve society, diminish poverty, and improve health outcomes. ProvenMed Technologies is a medical device company focused on the field of urine incontinence. Its flagship product, ActivGo, has been designed to offer a comfortable and cost effective urine incontinence management device revolutionizing the current market. RH Medical Design Co. is the creator of Alivio. Alivio is a female urinary aid designed to reduce pain associated with urination. Riby is an Open Banking Platform for African SMEs. They automate trade & savings groups called “cooperatives” across Africa and partner with banks & payment service providers to make access to finance and prudent finance management easier for their 920,000+ users. WakeCap is an enterprise solution to improve construction safety & productivity through technology. They help construction companies quantify labor productivity, automate workforce logistics, and improve safety measures. 1776 is a global network empowering innovators everywhere to shape the digital transformation of critical industries. At 1776, we know that startups can change the world and we’re building the global community to provide the intellectual, social, and financial capital to help them make that a reality. A Washington, DC-based investment firm founded by Steve Case in 2005, Revolution’s mission is to build disruptive, innovative companies that offer consumers more choice, convenience, and control in their lives. Revolution seeks to create significant value for companies that are attacking large, traditional industries with innovative new products and services. The Revolution team brings proven expertise in scaling up companies and helping to expand niche ideas into mass appeal. Everyone in the world should have the opportunity to pursue their world changing ideas, but many lack resources, guidance, funding and connections. That’s where UNION comes in. UNION is building a network that connects startups and organizations around the globe on one digital platform. The UNION platform connects startup founders, mentors, investors, and corporate innovators around the world. In its 79th year of service, CareFirst BlueCross BlueShield is a not-for-profit, non-stock health services company which, through its affiliates and subsidiaries, offers a comprehensive portfolio of products and administrative services to individuals and groups in Maryland, the District of Columbia and portions of Northern Virginia. 3Pillar Global is a product lifecycle management and development company that accelerates business growth. They believe in engineering software products that have a true purpose. And 3Pillar knows that you need a partner that doesn't just plan, but one who can get it done. At 3Pillar, they think big, they solve small. The Urban Redevelopment Authority of Pittsburgh (URA) is the City of Pittsburgh’s economic development agency, committed to creating jobs, expanding the City’s tax base, and improving the vitality of businesses and neighborhoods. The URA achieves this mission by assembling, preparing, and conveying sites for major mixed-use developments; and by providing a portfolio of programs that include financing for business location, relocation and expansion, housing construction and rehabilitation, and home purchases and improvements. HIMSS North America, a business unit within HIMSS, positively transforms health and healthcare through the best use of information and technology in the United States and Canada. As a cause-based non-profit, HIMSS North America provides thought leadership, community building, professional development, public policy, and events. Thousands of volunteers work through HIMSS to leverage the potential of digital health to improve both the health status of populations, as well as the quality, cost-effectiveness, access, and value of healthcare. Shaping the future at the intersection of media & technology. Comcast Corporation is a global media and technology company with two primary businesses, Comcast Cable and NBCUniversal. Comcast Cable is one of the nation's largest video, high-speed internet, and phone providers to residential customers under the XFINITY brand, and also provides these services to businesses. What started as an app to request premium black cars in a few metropolitan areas is now changing the logistical fabric of cities around the world. Uber created technology to give people what they want, when they want it. For the women and men who drive with Uber, the Uber app represents a flexible new way to earn money. For cities, Uber helps strengthen local economies, improve access to transportation, and make streets safer. When you make transportation as reliable as running water, everyone benefits. Accenture solves our clients’ toughest challenges by providing unmatched services in strategy, consulting, digital, technology and operations. We partner with more than three-quarters of the Fortune Global 500 and federal agencies to drive innovation to improve the way the world works and lives. With expertise across more than 40 industries and all business functions, we deliver transformational outcomes for a demanding new digital world. The Washington DC Economic Partnership (WDCEP) is a non-profit, public-private organization whose core purpose is to actively position, promote, and support economic development and business opportunities in Washington, DC. πzza is a counter-culture pizza brand built on the strength, unity and attitude of its living-wage-paid, ampersand-tattooed tribe, the renown of its critically acclaimed pies and handcrafted beverages, and the culture of &, with its act-unaccordingly philosophical foundation.